RADIO is fast becoming one of the most dangerous foes of the modern criminal. Often before he has fairly finished committing his crime, the news has gone out to all the police, broadcast over a powerful central radio station and picked up by squad cars cruising the streets. 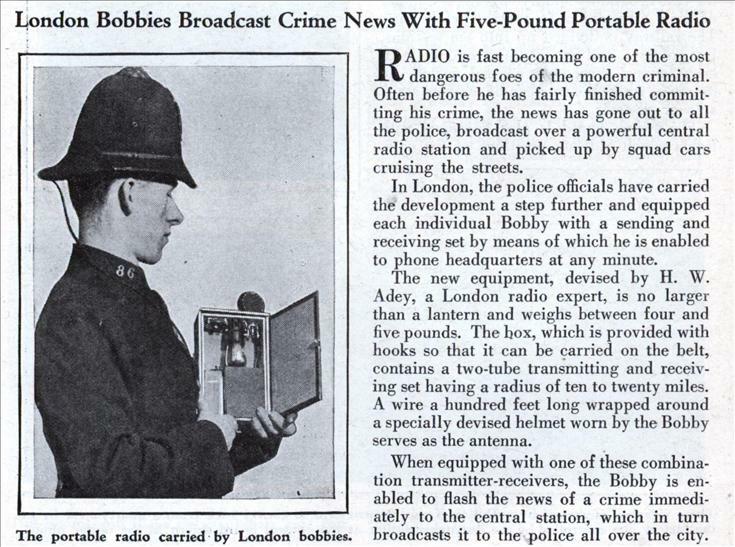 In London, the police officials have carried the development a step further and equipped each individual Bobby with a sending and receiving set by means of which he is enabled to phone headquarters at any minute. The new equipment, devised by H. W. Adey, a London radio expert, is no larger than a lantern and weighs between four and five pounds. The box, which is provided with hooks so that it can be carried on the belt, contains a two-tube transmitting and receiving set having a radius of ten to twenty miles. A wire a hundred feet long wrapped around a specially devised helmet worn by the Bobby serves as the antenna. When equipped with one of these combination transmitter-receivers, the Bobby is enabled to flash the news of a crime immediately to the central station, which in turn broadcasts it to the police all over the city. 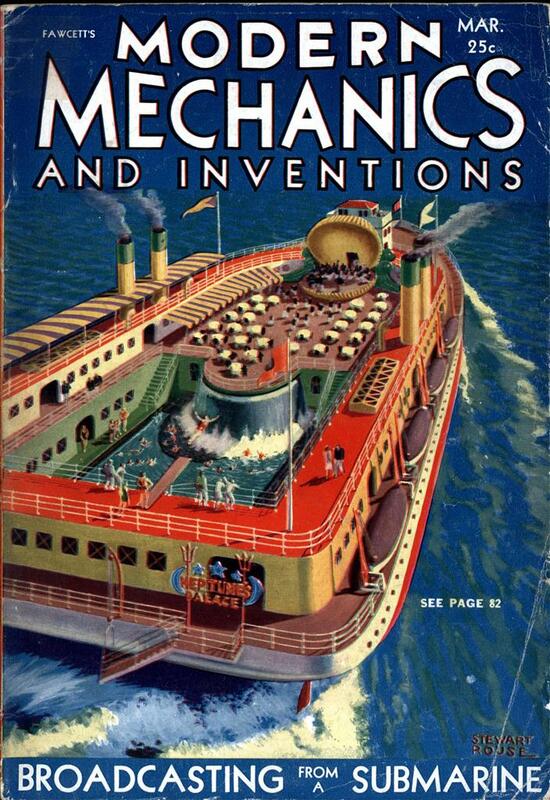 A very sound idea that only became practical with the invention of transistors. Now I think every police constable out there in the wide world is in radio contact. @ Stephen – Yeah, it was an idea who’s time hadn’t yet come, but if you look at pictures of London police today they all have small microphones near the shoulder attached to a radio. I like the “helmet antenna” idea. I wonder if the kevlar vests and the various radios/cels/etc cops carry and wear these days add up to more than 5 pounds. I know 5 pounds sounds really cheap today, but there has been a lot of inflation. 5 pounds back then was a lot of money. Casandro: they’re avoirdupois pounds (lb), not sterling pounds (£).